AquaBounty —a small company and the mastermind behind the fish— has faced significant opposition from activist groups like Greenpeace, NGOs, and even members of Congress. 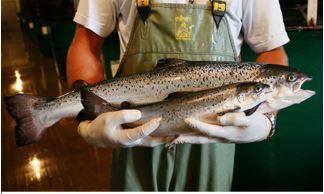 Arguments range from concerns about interbreeding with wild salmon populations to the “unknown” risks of newly introduced genes. However, after more than twenty years of backlash and a rigorous scientific assessment, AquaBounty’s GE salmon was officially approved for consumption by the FDA in 2015. Three years later, GE salmon has yet to make it onto our dinner plates due to lawsuits, labeling controversies, and other regulatory barriers. Canadians, however, have been consuming it since last year. But what actually are these GE fish, and what does the science say about them? Is the opposition warranted?